What is your favorite music venue in Milwaukee? That's one thing that people ask me from time to time. When they do, I have to answer with "that depends." Are we talking about shows at the BMO Harris Bradley Center? Are we talking about smaller venues like bars and clubs? Can I expand out to southeastern Wisconsin before I answer the question? There are so many great places to see bands here in Wisconsin. I guess I better cover my top three or four. The Riverside Theater is still one of the best places to see bands perform. The theater seats roughly 1300 people. It's one of the oldest theaters in the United States that is still in operation. The walls are ornate, the ceiling is high, but the sound in the venue is almost always great. Some of the stage views from the boxes along the side walls isn't the best, but you do get a chance to see into the wings from those areas. Over the years, I have found that it's best to sit around seven to ten rows back from the stage. The sound is better just a bit back from the front edge of the stage. As for the bands that come to the Riverside, the booking manager has nearly free reign when it comes to who he brings to Milwaukee. The Marcus Amphitheater is one of the best and worst places to see a show. How can it be both? If you are from Milwaukee, then you know that the Marcus is where the Summerfest headline acts perform. These performances are almost always sold out, and that means if you go, you are sitting with 23,000 of your fellow fans. Sometimes that can be the greatest thing in the world. Imagine being part of a group of people who all love the same band that you do. If you are lucky enough to get within the first twenty rows of the Marcus stage, you might even enjoy the sound. What's not so great about the Marcus? The sections numbered "One" and "Three" have views that are so far to the left and right, that you just don't enjoy the performance. This is an outdoor venue with a huge roof. The sound can get very muddy when it drifts beyond the first twenty rows. So if you are sitting far right, fifty rows from the stage, you begin to wonder why you bothered to pay $129 to see "Band X." Strangely enough, the sound and view gets better once you move beyond the bleachers. Some of the best shows that I have attended were on nights where I abandoned my reserved seat, and checked out the band from the lawn at the top of the venue. 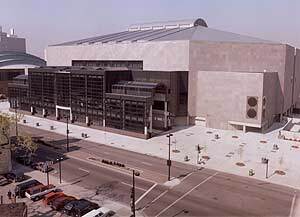 Turner Hall is just across the street from the Bradley Center in downtown Milwaukee. The actual hall was closed for decades, until the folks who run the Pabst and Riverside theaters decided to start booking shows there. It's one of my favorite places to see a show. The sound might not be the best, but the venue feels very welcoming. There is a second story balcony that offers an escape from the larger crowds on the main floor. The stage is high off the dance floor, and that means you can see your favorite musicians from just about anywhere in the venue. The wood floors are easy on the feet, for those of us who end up standing for three or four hours. The drink prices are pretty fair, but I would suggest that you order the double. The sound can be a bit muddy, depending on the style of music being played, but I have yet to attend a Turner hall show where I have left early, or where I headed out the door, just to get away from the crowd or noise.